What is so special about this one? Is it made with diamonds? No. Than what? The case is made in fact of stainless steel and is really elegant. This is how a suit wrist watch should be like. Simple, 3 hands, white dial, manual wind. Back to the case, we can see that it is really, really thin. In fact it is called Diamond Flake because at the time it was the thinest watch with 3 hands (about 7 mm thickness and 38mm diameter, with a really nice wrist presence and appears larger). In August 1962 it was the world’s thinnest 3 hands watch developed. The acrylic crystal is slightly domed making it thicker. The winding crown is small but easy to operate, not signed. On the case back it is marked with the model, serial no. 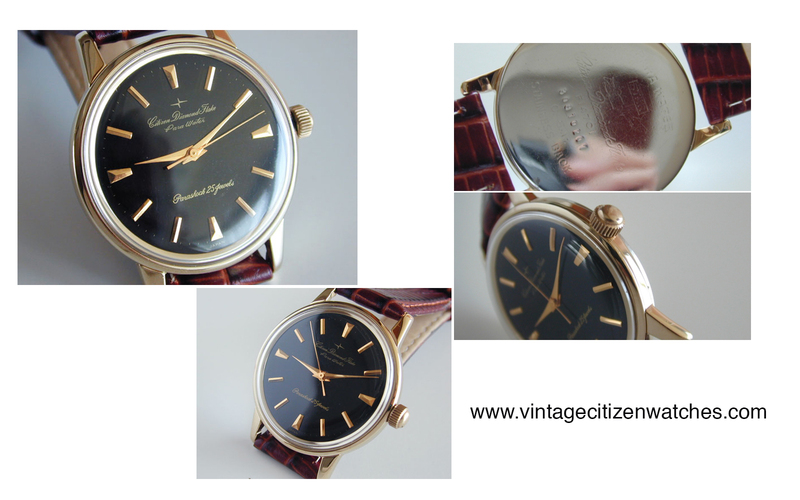 (dating this watch February ’63, that means it is one of the early production). The dial is very simple, silver, with a sunburst effect. The hour markers are applied and both the hour markers and the hands are polished without luminous material. It is marked: ” Citizen Diamond Flake” and “Parashock 25 jewels”. At 12 o clock there is the Diamond Flake logo. The movement is a piece of art named Citizen Calibre 0700. I love the way that it is gold plated. At the time the race for slimmer watches was on and having a thin movement was a must. Well, this one was the champion. 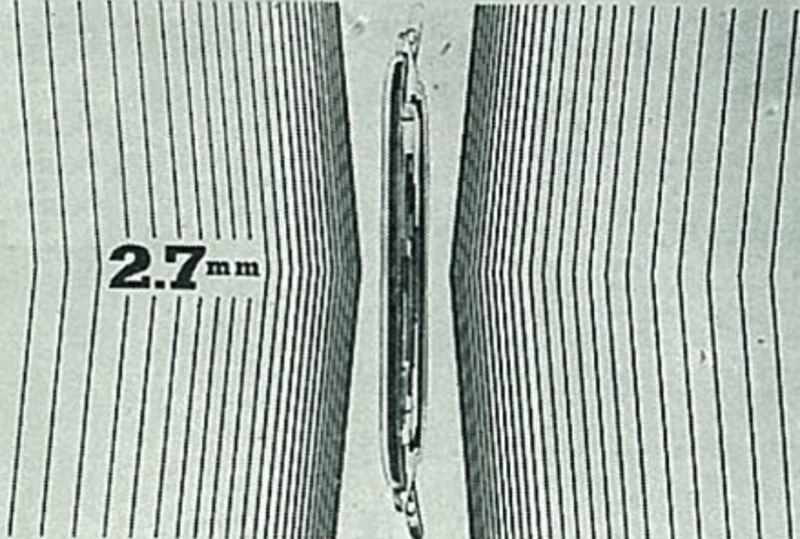 It is only 2.7mm, 0.2mm thinner than the competitor Seiko Gold Feather. The calibre 0700 has 25 Jewels (calibre 0701 had 31 jewels). Later on a date was added to the 25 jewels movement and this how Citizen calibre 2700 was born. The strap is a vintage Citizen brown leather one, with a stainless steel buckle. I think it compliments the watch nicely and adds something to the overall appeal of the watch. 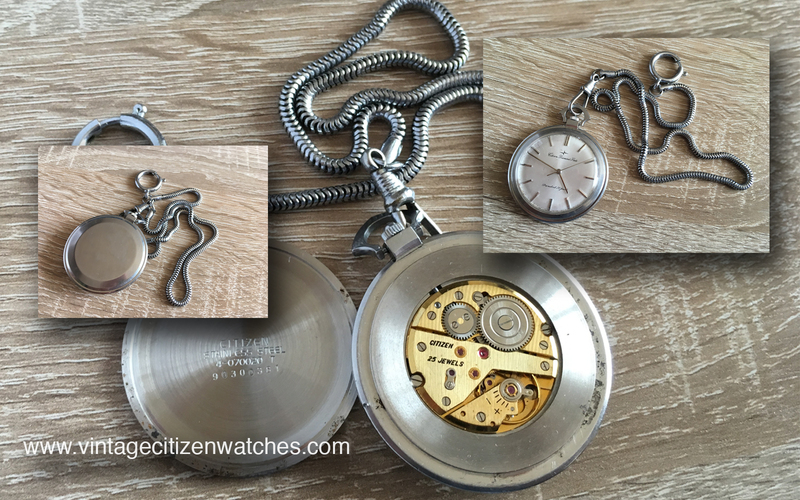 The watch can also be found (not easy, but it can de found – I did it) in a pocket watch form. Here it is, with original chain. Same beautiful movement in a large case, with an acrylic crystal. Conclusion – some might say that this is the ultimate elegant watch, some might say it the perfect suit one, but no one argues the fact that it has it’s well defined place in history as a champion of it’s own time. Update: I also found (pictures from the seller) a black dialed one (still not sure if original or repainted dial) in a gold plated case. The dial on this one is marked Parawater. Update 2017: We can’t really argue on the fact that this model is one of the best dress watches, isn’t it? Having it made of solid White Gold I guess it makes it even better. Is it perfect this way? I don’t know but it is a real beauty. Well… here it is so let me introduce to you, the pure awesome, the best of the best, my keeper, THE WG DIAMOND FLAKE! At the time the price was 40,000 JPY, and that was expensive! Read about the three brothers: Citizen Diamond Flake, Citizen Diamond Flake Date and Citizen Date Flake, HERE. 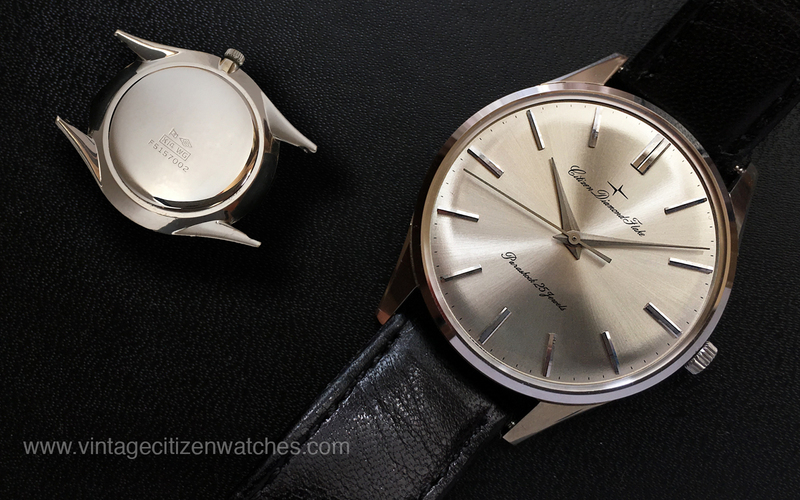 This entry was posted in Citizen history and data, hand winding, parashock, vintage Citizen and tagged cintage citizen, citizen 0700, citizen 0701, citizen 07400, citizen 25 jewels, citizen calibre 0070, citizen diamond flake, citizen diamond flake 0700, diamond flake, elegant watch, gold diamond flake, pocket watch diamond flake, solid gold diamond flafe, solid gold vintage citizen, suit watch, suit wtistwatch, thin watch, vintage citizen watch, wg diamond flake, world thinnest watch. Bookmark the permalink. Just bought a identical watch, mine like your have on the back the write STAR , do you mean why? Tks! Hello Daniele! Could you please post a picture? I only see one pic and I doubt it is the right one. In the description (second page) you can found all the pics…the watch need a service the plexi have scratch. Well… It is a Seiko, not a Citizen. Do you know how was the original box and certificate of guarantee ? I can’t found nothing on the web..
Citizen used different boxes and it was no such thing as a Certificate of guarantee. I have another question maybe do you know it.. The dial of the pocketwatch is the same (I mean the diameter )of the wristwatch dial ? I have never seen one that is the same size.